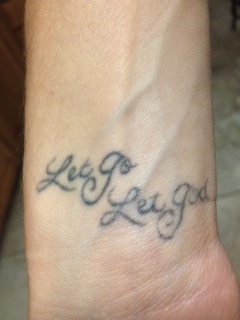 Let Go, Let God. This is a tattoo that I had gotten back in 2009 right before I had become pregnant with my first child. This happens to be a tattoo that I wish I didn’t get, or at least that I had chosen a different spot to put it. Don’t tell my dad I said that. Out of the five tattoos I have this one is definitely the most inspiring. It beats out my Marilyn Manson album covers or even my way too bright orange tiger, but still I have a bit of regrets with it. I think that has to do with my choice for it’s location. It is on my wrist and I am constantly catching sight of it out of the corner of my eye, thinking it’s a bug, causing me to swat at it. A little ridiculous, but nonetheless a positive mantra to live by. I got this tattoo following my struggle to get pregnant. Throughout my battle with anxiety I was constantly repeating this in my head, “Let Go, Let God, Let Go, Let God.” Like most things this was so much easier said than done. This period in my life was a time where my anxiety was making appearances by the minute and I was constantly telling myself to let go and trust my faith in God. I have joked more than once that this tattoo should have said, “Let Go, Let Renee,” because like most anxiety sufferers I was a serious control freak. I needed to feel like I was always in control. On the outside you wouldn’t necessarily be able to tell I was this way, but it was a completely different story on the inside. I wanted to be in control of everything down to how many breaths I took. While in a conversation with a friend I would mentally plan when I was going to take my next breath and when I was going to shift my weight. I would calculate each move in my day. I felt like a robot, literally. I moved like one, thought like one and felt numb on the inside, just like one. Well here’s the thing, in overcoming your anxiety you have to give up your need for control. Insert gasp here for all you control freaks out there. Being in control was a false reality, one that I was gripping onto for dear life and yet to heal I needed to let go. I am a big believer in God, but yet putting my whole heart into trusting him was a big challenge for me. What if I didn’t like his plan? What was I to do then? I had a plan in my head that I envisioned and I was going after that plan. I was chasing after this “perfect” feeling. In my mind if I was anxiety free I would feel perfect. Yes really, I would feel perfect. My body would feel great and I would never get headaches. I would never feel sad or angry or disappointed. I would never feel anxious or on edge. I would never have a bad day. I would do everything right and no one would ever be upset with me. My heart rate would stay at a normal steady rate no matter what I was doing. I wouldn’t get sore after a good workout. I would never make any mistakes. I would be perfect. Could you even imagine how exhausting it is to chase the feeling of perfection day after day? And then imagine the disappointment each day that perfection wasn’t reached. When you chase something that doesn’t exist it is like running on a hamster wheel. You are going nowhere and in the end you are exactly where you started, just now you are really tired and completely defeated. Around the middle of 2012 I was home sitting on the couch. My oldest was at gymnastics and my youngest at the time was taking a nap, so I was trying to enjoy a rare moment to myself. I was reading through a few Psalms in the bible hoping that something would pop out and bring hope into my heart. Psalm after Psalm I read and felt nothing. I finally closed the bible and literally got down on my knees and prayed. I prayed to God asking for guidance and strength. I prayed that he would lead me down the path of healing. I began crying as I felt a weakness overcome my body. For so long I had tried to be strong and with each failed effort I was left feeling weak and worthless. I soon found myself begging God for an answer, for my heart to be healed. I had been suffering for so long and I didn’t know how much more I could take before I would break. I have this verse in my room and I have read it so many times. There would be days that I would read it over and over as it stood atop my jewelry box, but it never really made sense to me. On this day in my living room as I was down on my knees this verse came to life. For the first time in over a decade I felt a peace overcome me. For a brief moment my mind was quiet. In the stillness of my mind I had found the answer. I needed to let go. I needed to let go of the desire to do things my way. I had all the tools right in front of my face, I was just too stubborn and angry to use them the right way. God had already shown me the way, I just needed to follow. I needed to stop chasing after the perfect feeling because it didn’t exist. I was human and in this beautiful world I was birthed with perfect imperfections. Feeling wholeheartedly was the only way to really live and in doing so I had to open myself to all feelings, good and bad. This was it, I put my boxing gloves down and declared mercy. I couldn’t fight anymore. My way was not the way. I had tried it for too long and it clearly didn’t work. Once I let go and stopped fighting the answers began to come in more clearly. I was finally ready to let go. Truly amazing Renee! First off your are a great writer! I’m hooked on every word & always look forward to each blog. You really are helping people. So many of us feel these things or something similar & keep them bottled up inside. You are amazing & I love you!